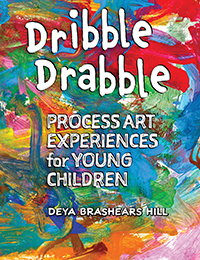 Dribble Drabble: Process Art Experiences for Young Children by Deya Brashears Hill brings 145 process-oriented art activities to help you set up a rich art environment in any setting. Discover the stages of art development and use the activities for individual art or in project-based collabroative art expressions. The following is a note from author Deya Brashears Hill on how she came to love art and being creative. 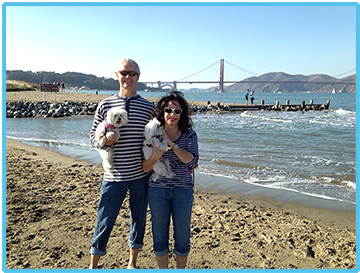 She shares why she decided to write Dribble Drabble and how her passion for art has translated to a passionate and joyful life. When I was six and in first grade, the art teacher would come into the classroom each week rolling her “art cart” with her. She would show us a model of something that we would be doing for art class and we were supposed to copy her model. I remember one spring time she held up a “color-in model” of a baby duck that we were asked to copy. Well, instead of yellow, I made my duck purple because, after all, it was MY favorite color. She took my finished product and held it for the whole class to see and said, “this is how not to do it.” I was mortified and from then on I did not like art, that lady, or the “art cart.” I actually developed a fear of art just as many of you may have a fear of math or public speaking. As I continued in my education, I never took an art class and avoided it as any elective options but when I went onto my four-year university, it was a required subject to become a teacher. I was so scared that I put it off until my senior year—can you imagine! Then I took a REAL art class and a whole new world opened up to me. I became totally enthralled with art and color and creativity and I also became angry about how I was ripped off and not given the opportunity to enjoy such a pleasure in life. I was determined to not have another child have a similar experience if I could at all help it and that is when I published my first art book for children, Dribble Drabble. These activities are process-oriented art experiences that children of all ages can enjoy. As I worked with children from preschool through about sixth grade, I offered them opportunities to experience hands-on, fun, art exercises. I observed and tweaked the experiences so that they were more successful. My own daughter became my tester for all of my books and we would together try out many of our creations. That’s how my books came about. Because they are child-tested and teacher created, they are practical, easy to set-up and follow, and tons of fun. I think the best compliment that I ever received mentioned that my activities have “soul.” Anyone who works with children intuitively knows what that means. In addition to teaching children, my passions include teaching anyone anything at any age, so the college arena has given me the opportunity to spread my wings and teach a variety of subjects to adults within the child development discipline. This brings me a great deal of joy and pleasure. My dogs are another source of joy and pleasure for me. Dogs and all animals are such interesting, not to mention loving, creatures and I cannot imagine a life without my furry friends to share it. My husband and I love to travel and our most life-changing trip thus far was going on safari in Kenya and Tanzania—again those animals just stole our hearts. Lastly, being active through dance classes or aerobics is something that has always been a big part of my life and will continue to be as long as I can waddle around. I love my profession and the students, children, and colleagues I meet and sometimes someone asks me when I plan to retire. This is always surprising to me since I have no desire to do such a thing. As for now, I will continue to enjoy my rich life and maybe someday I can see myself moving onto another journey. But right now, I’m just not done working in this incredible field of Early Childhood Education! 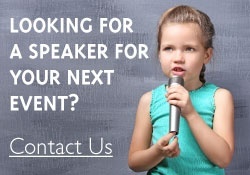 Learn more and see a full list of titles by Deya Brashears Hill.